If it’s the first time you need to consider buying a belt sander, then you should know that these are basically heavy tools that can help you get a smooth finish on your walls or various other materials. Choosing one is not hard, but there are some features you need to be aware of. For example, the handheld versions are the most popular out there and they include a sanding belt, a motor, a dust collection unit and rear and front handles. Of course, these specifications will vary depending on the manufacturer and since you’ll be holding it in your hand for long periods of time, it’s best if you get a light model that does a great job. For smaller sanding jobs you’ll be very happy to know that some of these models allow you to adjust the motor speed. The belts come in a plethora do sizes, while the amperage on the motor is different with each manufacturer and model. The most common belt sizes though include three by eighteen inches, three by twenty one inches and four by twenty four inches, allowing you to complete most household jobs with ease. Depending on your project, you may also need to go for a stationary belt sander, but keep in mind that these types are more expensive than the handheld ones and are usually considered by construction companies for heavy duty work (Other tools available: https://www.thetoolsy.com). As for the sanding belts, they are much larger, usually six by forty eight inches and up to twenty five by sixty inches. If you need to round off square edges of large pieces, then these tools are going to help you very much with that. And if you took your time to read the time to read the Belt Sander Reviews online, you may already know that they are generally made from cast iron, but the portable ones may also include metal and heavy duty plastic components. In order to make it very simple to use even by those who have never used a belt sander before, the Black and Decker DS321 has a very interesting features that will make using it a sheer pleasure. For example, you’ll find that you can easily adjust the top handle to 3 different positions that increase user comfort, while the belt’s front hood can be retracted so that you can easily access the top of the sanding belt. Lastly, the DS321 is designed in such a way that it can be used to operate flush to a vertical surface. When it comes to the sander’s engine, it has seven amps and it’s capable of running at a speed of eight hundred feet per 60 seconds. And if you want to replace the belt, you can easily do that thanks to the single action lever the DS321 features. Overall, this model is a great piece of hardware that can easily be used for at-home projects, since it delivers amazing results without getting you exhausted. Everything about the DS321 is exceptional, but some users found that they need to center the belt all the time, because its tracking is just not that great. Some people may be willing to invest in an economical variable speed belt sander and if that is the case with you, then you’re going to find the Ridgid R2740 to be exactly what you’re looking for. Ridging fitted their belt sander with a six point five amp motor, allowing you to adjust sanding speed from 400 feet and up to nine hundred and fifty feet per minute on a three by eighteen inch sanding belt. In order to pick up dust and especially cool the motor off, the Ridgid R2740 comes with twin fans that drastically improve the sander’s ease of operation and of course, efficiency. Holding the R2740 is simplified thanks to the soft grip handles that greatly minimize vibration and allow you to get the job done without getting your arm sore. If you always find yourself doing something around the house that has involves sanding, then the R2740 is undoubtedly one of the best choices you can currently consider. The R2740 is a great choice to consider when you need to use it for at-home projects, but after a few hours of use, some people said the belt started to slow down. If you value a space saving design and a belt sander that doesn’t require a lot of dexterity to handle, then you are going to find the Ryobi ZRBE318 to be a very good choice no matter the types of projects you want to consider. It features a three by eighteen inch sanding belt that is pulled at seven hundred feet a minute by its powerful 5,3 amp motor. On top of that, the ZRBE318 features a belt tension system that comes with a quick release lever, allowing you to change the belt anytime without any hassle. Locking the ZRBE318 in place is very simple when doing so, you can easily keep the belt in line while using the sander. And while this model is fitted with a dust bag, you can remove it if you want to attach the dust port to a shop vacuum. This way, you’re going to greatly minimize the spread of sawdust. No one can disagree to the fact that the ZRBE318 is a great belt sander, but some people felt like it was too hard to control. On top of that, some users said that the vacuum attachment is cheaply made and cannot be hooked onto the unit securely. 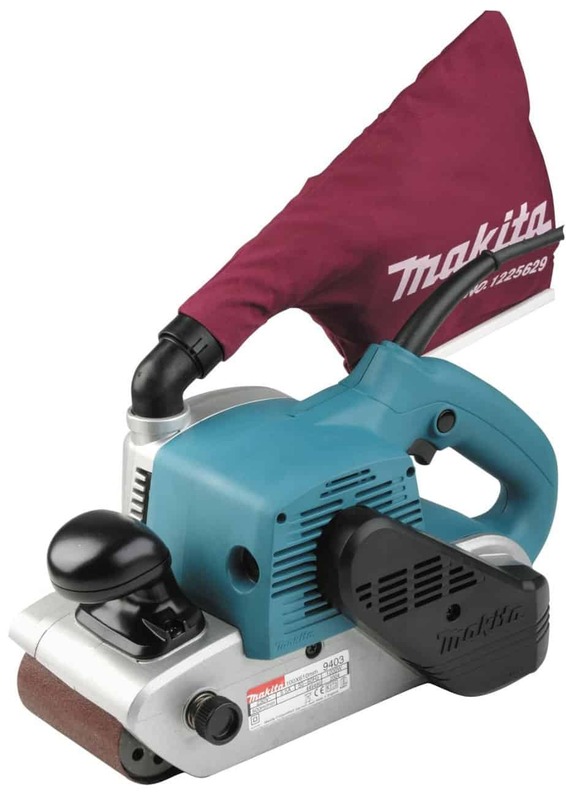 Some people don’t need a very powerful belt sander, since they may only have a few surfaces to sand at home, but when you need a very capable tool that can sand a wide variety of surfaces, then you cannot go wrong with the Makita 9403. This model features a massive eleven amp motor that can pull the sanding belt at a whopping 1,640 feet a minute. It comes with a four by twenty four inch belt that covers a large surface area which allows users to easily sand large surfaces in a short period of time. To improve comfort while using it, the Makita 9403 features a big knob style front grip, while the cord (which is mounted on top) provides less interference for a job well done. Making sure the working environment is as clean as possible is the priority of many of us, since no one likes to spend another 30 or 60 minutes to clean up the area after they’re done sanding. In this regard, the Makita 9403’s dust bag can swivel at a full 360 degrees, allowing for unrestricted operation. Lastly, the 9403 is designed in such a way that you can position its nose and sand flush to a trim panel or a wall. While this may not happen to anyone, it’s good to know that some of the people who used the Makita 9403 said the dust bag elbow failed in just ten seconds of use. Anyone who is looking for a belt sander that has a variable speed needs to consider getting the Porter Cable 352VS as soon as possible. Why is that? Well, this belt sander has an eight amp motor that can produce a belt speed that ranges between eight hundred and fifty and thirteen hundred feet a minute, so you can adjust it based on the materials you need to sand. The belt size is three by twenty one inches in size and if you want to flush furniture pieces, trim or vertical walls, then you can easily do that thanks to the body clearance the 352VS has. In terms of comfort, the Porter Cable 352VS is very easy to grip, thanks to its front ergonomic handle that gives you good control over the tool’s operation no matter the belt speed. Lastly, for unhindered sanding, the dust bag which is mounted on top of the unit can be rotated to any position you want. While the unit comes with a dust bag, it just doesn’t collect the dust as it should and it will generally shoot it in your face. If you’d have me choose one of the belt sanders on this list, then I would definitely go with the Makita 9403 right away. The reason I go with it is because the projects I generally need to consider require a lot of power and I find this model to deliver exactly the amount I am looking for. The belt is also wide enough, so I don’t need to go over the surface multiple times in order to properly cover it. Probably what makes this my favorite is the unique knob style front grip, that allows me to hold the 9403 easily in my hand without fearing that it’s going to slip. Because of that and the ability to swivel the dust bug at 360 degrees, I can truly say this model is one, if not the best belt sander you can currently get.